Timothy Taylor’s latest book tracks the relationship between music and advertising from the early 20th century to the present. A professor of musicology—both ethnomusicology and the regular kind—at UCLA, Taylor has written several books on music, including Global Pop: World Music, World Markets and Beyond Exoticism: Western Music and the World. He continues to examine the relationship between music and our economic system, especially the ways they contribute to and reinforce each other. The Sounds Of Capitalism begins with the development of the radio, the first piece of technology that allowed the mass propagation of sound. As NBC put it, “Tell it to the masses, and the classes will understand.” And since “the great common denominator of broadcasting” was music, tunes served to attract those masses, regardless of class divisions. When the Depression hit, a quicker, cheaper, and upbeat musical advertising pitch—the jingle—came into being. Rising levels of regulation in the world of written advertisements added to the ever-expanding role of music in stimulating consumption. In the ‘60s, advertising music began to mirror the pop and rock of the day, as advertisers worked harder to hook the young people who now ruled popular culture. The jingle that had seduced so many buyers for so many years began to seem stagnant, and it declined in importance, replaced by truly unstoppable cultural juggernauts: pop songs. After this point, according to Taylor, the advertising world and the music world became increasingly close and co-dependent. Advertisers started licensing popular songs and paying successful musicians to endorse products. Advertising Age described this process with a nice turn of phrase: “converting band loyalty to brand loyalty.” But the process also goes in the opposite direction—ad people, especially in recent years, look to break new bands to an audience. And as radio grows increasingly monopolized, musicians seeking to get their music to a wide audience must rely more on advertisements, television shows and movies. 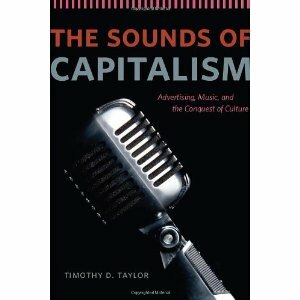 By the end of The Sounds Of Capitalism, Taylor drops the empirical and turns instead to cultural theory. That point strikes me as both patronizing and out-of-date. Hasn’t the avant-garde been the foundation of the legitimate for years now? This is certainly the case in many genres of popular music: Look at The Velvet Underground in the late ‘60s or the Talking Heads and other CBGB groups in the late ‘70s. See the rise of indie on defiantly tiny labels in the ‘80s. Check out the Riot-Grrrl movement in the ‘90s. What about the progression of hip-hop and electronic music from small-scale movements with local bases to hugely influential forces? Subversion is practically the definition of cultural movement in music. And music is not alone—other forms of art show similar progressions. Andy Warhol, Jasper Johns and other artists started underground and avant-garde, only to have their work embraced as “legitimate culture” and sold for millions of dollars. In fact, doesn’t the corrupting power of commerce often require that legitimate culture gain its legitimacy from the underground? What better way can it incubate and develop free of the pressure of profit than by using its avant-garde origin as a test of its artistry? But maybe he has things twisted? As artists of aggregate demand, ad-makers put us in the cage. That’s where we rationalize desires we did not know we had only moments ago.